May 7, 2018 5:00 P.M.
Also present were Rich Simon – Director of Public Works, Dustin Bedore – Director of Electric Utilities, Joni Showalter-Police Chief, Brian James – Fire Chief, Mary Volk – City Clerk, and Andrew Finzen – City Manager. National Police Week Proclamation – Mayor Linin proclaimed the week of May 13-19, 2018 as National Police Week in the City of Goodland. Mayor Linin thanked the department for their service. Operation Red File Presentation: Laci Leichliter – Laci stated, I want to inform Commission of Operation Red File project that the hospital’s Social Service Department, Life Team, EMS, Sheriff’s Office and Police Department are working on. This red file contains all emergency information for individuals at a house where First Responders may be called to respond in an emergency. I encourage everyone to complete advance directives for needs. County Appraiser Introduction: Rochelle Stanley – Rochelle stated, I am the County Appraiser and wanted to take the time to introduce myself to the Commission. I began in Sherman County August 2017 and share responsibility with Rawlins County. I want the City and County to work together and be a part of the solution not the problem. I have an open door policy and would like to be positive for Goodland and Sherman County. The more people work together the stronger the community will be. We have to look outside the box to bring in new industry to our community. I discussed this with the County Commission and they agree. Commissioner Fairbanks stated, I appreciate your positive attitude. Run for the Wall Proclamation – Mayor Linin proclaimed May 19th as Run for the Wall day in Goodland. ON A MOTION by Commissioner Fairbanks to approve Consent Agenda seconded by Commissioner Garcia. MOTION carried on a VOTE of 5-0. Pickle ball at Chambers Park – Andrew stated, at the Commission’s previous discussion on Pickle ball at Chambers Park, it was referred to Parks and Recreation Board. There was a lot of discussion on what direction to head and the decision was to utilize one court on south side of slab using a temporary nets to be checked in and out at GAC. The City has paint court at no additional cost to paint the court. This will allow them to gauge level of interest in activity for future. Commissioner Fairbanks asked, so everything runs through GAC not City. Andrew stated, yes. ON A MOTION by Vice-Mayor Brumbaugh to approve the use of the south side of concrete slab at gazebo in Chambers Park for Pickle ball seconded by Commissioner Fairbanks. MOTION carried on a VOTE of 5-0. Preliminary Approval of Construction Engineering Services for Brick Street Project – Andrew stated, since this project is funded by KDOT, the City was required to advertise for bids of construction engineering. Only one firm, EBH, submitted a Statement of Qualification. If Commission agrees to proceed, I will begin negotiations for contract of construction engineering. All costs are processed through KDOT since they are funding project. ON A MOTION by Commissioner Fairbanks to proceed with contract negotiations with EBH seconded by Commissioner Schields. MOTION carried on a VOTE of 5-0. Airport Projects and Funding Needs: Dustin Stephenson and Jon Yost, Airport Board – Dustin Stephenson, Airport Board Chairman stated, we want to discuss upcoming project needs at the airport with the Commission. 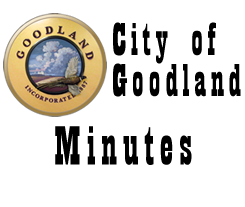 The airport has a big economic impact in bringing business to Goodland. The main runway has lasted twenty years more than expected and there are several projects out there that need attention and involve large costs. Cross wind runway 5-23 is in bad shape with gaps in concrete where wheels of small planes can fall into. It is usable but needs improvement; we have grass and main runway as backup. The main runway will be next in line after cross wind runway. It is the oldest runway in country and has held up well but will start seeing it fail. When it gets redone, it will be lengthened. We are getting close to getting Master Plan approved. If there is a project in your plan and FAA approves completing project, we have to have our 10% funding available. Jon Yost, Airport Board Vice Chairman stated, the cost of cross wind runway is approximately $3,000,000; the City has 10% funding available but it will deplete City funds. Only hangar rent is going into that fund annually right now. The main runway project costs are approximately $15,000,000. Mayor Linin asked, can they inspect the runway so we know where it stands. Dustin stated, I believe they do every so often, unsure when scheduled again. We do not want to repair runway before needed, but need to have funds available when awarded grant. FAA determines when project needs to be done and where we fall into plan with other airports in State. Mayor Linin stated, it would be nice to know where we stand to help planning. Are there other funding options available to assist with this project? Dustin stated, can apply for other grant money but this grant falls within 90/10 program. We can follow up with the FAA when they will do an inspection. Commissioner Garcia asked, what is hold up on master plan? Jon stated, we had a conference call with the FAA and Andrew attended the meeting in Kansas City to discuss the plan. It was a positive meeting; and we feel it was good to have met with them face to face. Andrew stated, the holdup is between the consultants and regional planner. We are all frustrated it has been pushed out but feel project should be wrapped up by end of summer. Vice-Mayor Brumbaugh asked, how much are you planning to extend the runway? Dustin stated, the cross wind runway 5-23 would go to 4,000 feet. Vice-Mayor Brumbaugh asked, are they mandating the extension? Dustin stated, it is not mandated but we try to come up with what makes most sense to make runway most usable. 4,000 feet makes more sense than 3,500 feet on windy days. Same is true on main runway, but have to watch costs and what category the extension will take your airport to. The main runway is now 5,500 feet but looking at all factors and to remain a category B airport it makes sense to go to 6,900 feet. Beyond that it is not necessary and forces us into another category. The extension is planned on south end for the most part. FAA will pay to move ILS equipment one time so want to make sure do what is right for the City for a long time. Right now the length is not the issue but the weight to get larger aircraft to land in Goodland. Vice-Mayor Brumbaugh asked, what other aircraft will land if we extend to 6,900feet? Dustin stated, it will mostly help on weather days if there is contamination on runway, like ice or rain. It is a balancing act to ensure we get what we need. Jon stated, our concern is to make sure with upcoming budget that we get some assistance to fund airport. We feel if you can start putting one to one and half mills in budget to start putting money away it will help. That will not be enough money when project is ready to go but need to be as prepared as we can when FAA approves project. Commissioner Garcia stated, I appreciate you keeping us informed and getting involved with airport. Mayor Linin stated, I echo that, if we are not informed we make decisions on what we feel is right. Keep fighting and we need to work together to move forward. You will not always get what you want but we have to work together. Topside Trail – Andrew stated, this community project came about from the strategic doing. Commissioner’s Fairbanks and Shields are on committee along with Adam Schart, myself and other community members. The Hansen Foundation has funded the project $250,000, but total project costs are estimated at $448,000. We plan to pursue other options for funding to ensure project is not funded with tax payer money. The trail will be on public land so upkeep and maintenance will fall back on City. At this time we need Commission’s approval of project. The initial concept is for the trail to go from Pioneer Park, around waterpark and around college. This includes a dog park by Welcome Center. Then new addition is to add splash park and amphitheater in Gulick Park. The committee is meeting to discuss next steps and direction heading, but would like Commission to approve use of land. Commissioner Fairbanks stated, we are concentrating on dog park and trail around waterpark and through college. Trying to incorporate some education into trail to make it multi-faceted. Andrew stated, in areas we have existing sidewalk so it is a lower priority to widen the path to a walking trail. Commissioner Fairbanks stated, the college has been highly involved with engineering department; have been very instrumental to give students pathways to various parts of town. The City was awarded a grant a number of years ago, but State pulled money and now a portion of project has been funded to get first step of project started. Trying to determine where the grant will get us with the trail. The splash park will not be elaborate because we have a good pool facility, but this is a way to pull people to the middle of our town. Vice-Mayor Brumbaugh stated, great job to the group of citizens working on this. Commissioner Schields stated, the college has done a great job with their involvement on the project. Andrew stated, we originally hoped to do more planning for the Commission, but many people knew about the grant so we needed to get information to Commission. We will be back in June to get formal action from Commission when we get some additional information and funding. Commissioner Fairbanks stated, we need to emphasize this is not funded by tax payer money. Fire Department Training Facility – Brian stated, our goal is to have a live fire, search and rescue facility to use anytime and not be concerned about hurting someone’s property. A facility to also train for high angle rescue. We are asking Commission permission to house facility in Industrial Park; we will maintain FAA height restrictions. The better location is east of Weather Service because rugged lot that probably will not be developed. Conducting training at this location will allow us to have training and not have to remove equipment immediately, which is required when using the parking lot at our building. This lot is out of the way and will not cause issue with public. I would like to apply for grant funds and start putting money away in outlay but need permission to use this location. Fire Board feels this is another project City and County Fire can work together on since it will be used by both departments. These facilities will help us become a better trained Fire Department. Commissioner Fairbanks asked, if you light fires does that have any effect with FAA and Weather Service? Brian stated, there will be minimal smoke, but will ask them. Vice-Mayor Brumbaugh asked, what is the cost for projects? Brian stated, a bare minimum system is $245,000 for bullhead system and $220,000 for the sable system. Mayor Linin asked, thinking about budget, is this additional money in your budget or are you reallocating money? Brian stated, this is an additional item; the ideal timeline for funding is five years, but it will all depend on the grants I apply for and receive. Consensus of Commission is to move forward with budget item using the lot east of the Weather Service. Mayor Linin stated, I would like us to move forward as it is good idea to find location where the facility is out of sight, but I am concerned with the budget. Ordinance 1713: Off-Street Parking – Andrew stated, I have made changes as Commission requested so that the language is not restrictive on driveway particle. It does prohibit surfaces such as grass, wood chips or carpet. There is a restriction that no more than 50% of front yard can be used for parking and limit to seven vehicles at a home. Penalty is minimum of $30, not more than $100 per day for each violation. Vice-Mayor Brumbaugh stated, it is tough, I have looked around and there is no perfect way to write ordinance. Not everyone will like restrictions we put in place. Once approved, what is timeline is effective? Andrew stated, I feel thirty days, like we did alarm ordinance. Troy Mannis citizen asked, has there been any consideration on the cost for a resident to comply? I have done some research to lay ground up millings or cement in my property and it ranges from $1,200 to $7,000. How are people going to deal with this cost? Vice-Mayor Brumbaugh stated, this is what happens when we let code go for so long. This is common language used by other Cities, we are just getting to where we should have been years ago. We have to define driveway, cheapest route to go is gravel with timber outline along driveway. Good example is a driveway on Caldwell, it is definitely defined as a driveway. That is why I asked how long we will permit to implement this. Troy stated, I keep mine maintained but if I lay gravel I cannot open doors to garage. I am frustrated with those that jump the curb to park their vehicles in the front yard. Vice-Mayor Brumbaugh stated, it is not perfect and will not make everyone happy. Troy stated, if this is the case, why do you not change code to allow buildings on vacant lots; I would build one building to have room for all my vehicles and take down the two small sheds. Mayor Linin stated, we have asked planning and zoning to look at this and they recommended code warranted no changes. But will this warrant something to change that code? Commissioner Garcia stated, if we change that particular code, setting aesthetic standards to create tax flow for community, we would not have empty lots that do not generate tax revenue. Troy stated, if I could do that it would increase my property value. Vice-Mayor Brumbaugh stated, we need to look at the building because if it is something nice it will help property values. They already work to get around existing code. Andrew stated, the Planning Commission is defunct as there is not enough members to staff it and with new board we will not have a good resource for a year. Commissioner Garcia stated, the Commission has final decision, where citizens get around the code already, it would help if we can get code changed to allow them to build a nice structure. Vice-Mayor Brumbaugh asked, can Commission come up with an ordinance to help coordinate this ordinance? Mayor Linin stated, we have to be careful. Brian stated, in past Commission voted against change because did not want a city full of garages that accumulate car parts and become a nuisance. Commission needs to communicate how to enforce the code. Commissioner Schields stated, Troy’s lot is neat and tidy, our intention were those that are not so nice. Commissioner Fairbanks stated, it is difficult because once it is approved, it has to apply to everyone. Mayor Linin stated, we cannot pick and choose what to enforce but have to pick and choose what is and is not blithe. We have to have solution that works for everyone. Vice-Mayor Brumbaugh asked, will this address current vacant lots? Andrew stated, ordinance states driveway for all weather approved surface so if a vacant lot this ordinance is applicable. Troy asked, what does that do with visitors parking in my lot? Commissioner Fairbanks stated, there is a permitting process in place for that. Mayor Linin stated, we are trying to address those that park there perpetually, not temporary visitors. I appreciate you bringing your concern to the Commission. Brian asked, is main concern of the Commission, parking on grass or not on a surface. What is your main goal? If it is preventing people from parking all over property, they can do it if have the proper surface. Vice-Mayor Brumbaugh stated, other cities do not allow parking in yards because it starts attracting junk, inoperable vehicles and then we have an unfit structure. When live in city have to have standards, this is a minimum standard. J.J. Howard, citizen stated, many people in Goodland cannot afford these changes. We are not a big city, let people live how they want to. They need to make a living without being driven out of town. Vice-Mayor Brumbaugh stated, there is a difference to letting them live and giving them a standard. J.J. stated, I agree, it should have a driveway to get on property and not allow them to jump the curb. Mayor Linin stated, I agree need to let people live to an extent, but doors swing both ways. We do not want to run either class of people off, but have to have rules that run both ways. Our role is to try to protect assets of all of our citizens. J.J. stated, that goes back to building a structure on vacant lots; that is why you have code enforcement to enforce the aesthetics of the building. Vice-Mayor Brumbaugh stated, that is what we are trying to fix. The town is hurting if you do not have ordinance to fix. Mayor Linin stated, I feel Commission would like to look at changing rule on shop style buildings to ensure aesthetically pleasing to help community look nice. Vice-Mayor Brumbaugh stated, let Commission think about what has been said tonight. I feel what is written in ordinance looks good for now. Sewer Rates – Andrew stated, sewer rates were last reviewed in 2004 and 2005. We have revenue concerns with sewer budget as it is coming in lower than budgeted but staying afloat because expenses doing the same. As a utility fund should operate as a business account. Fee is based on water average but water usage is decreasing so revenues are declining. I do not feel having a rate based on consumption will be sustainable. Sewer is funded 70% by residential and 30% by commercial customers. Average customer cost in Goodland is about $10.50 per residential customer. With commercial customers you see more fluctuations. It has also decreased a lot because consumption has decreased. Sewer rate in Goodland is substantially lower than any neighboring community. To stabilize sewer fund, need to raise $150,000 in sewer revenue, which would mean annual revenue of $500,000 split $350,000 residential customers and $150,000 commercial customers. My concern is current rate structure, based on consumption. I propose a three year three step process to get utility stabilized. Begin with a flat rate on system for residential customers of $13, up from the average of $10.50 to bring revenue to $323,000 then base commercial rate on consumption but increase base cost to $7 with a consumption charge of $1.50 per 100 cubic feet to get revenue to $140,612. In year two bump residential rate to $14 for $350,000 in revenue and commercial base to $8 with a consumption charge of $1.75 per 100 cubic feet for approximately $163,378 in revenue. The final stage in year three is an annual twenty cent increase on each base, subject to review. If we do not need the annual increase one year, do not approve it. This will prevent the situation you have now where rates have not been changed for fourteen years. Mayor Linin asked, why not do a flat rate on commercial like you consider in residential? Andrew stated, to get commercial flat rate set it would be too high. If Commission has questions, let me know. I would like to bring back to June meeting but in mean time get information out to public. Commissioner Garcia stated, when contemplating rate increases I feel it is better to set rate high so only one increase and set it. Mayor Linin stated, I agree to the point where we set the rate, but need to have small annual incremental increase where people can handle it. Vice- Mayor Brumbaugh stated, I think we should phase increase so it not so abrupt. Mayor Linin stated, I think it is tougher when phase increases, but need to have the twenty cents per year written into code. If Commission prefers to set rate proposed for second year right away it might make transition smoother. Review of Board Applicants – Andrew stated, applications are for the City’s newly created Construction Advisory Board of Trades and Appeals (CABT). Applicants included are Mike McClure, Charles Baker, Randy Topliff, Zach Lohr, and Stacy Owens. There are seven positions to be filled on this board, and board criteria is to have one licensed individual from each of the following: residential contractor, general commercial contractor, master electrician, master plumber, master mechanic (HVAC), realtor and a member at large. Stacy resides in Edson but ordinance allows leniency. City Managers Report- 1. The cemetery information is out on social media as we continue to work on plan. We have seeded buffalo grass but cannot spray for dandelions as affects germination. Everyone was aware it was going to be a multi-year process to get cemetery back to looking nice. We continue moving forward and making progress. 2. Offices will be closed May 28th in honor of Memorial Day. The open house for Police Department was April 28th. Despite rescheduling it, we still had a good turn out. 4. The street project is scheduled to begin in June. 5. GIS project is 99% done with data collection; going to deploy end of summer. 6. City crews have completed work on the alley behind City Office. It is fantastic to be able to do concrete work in house. We are very fortunate to have the crew we do. 7. The unfit structures will return to agenda May 21st. City Clerk – Mary informed the Commission of projects and information the office is currently working on. Vice-Mayor Brumbaugh – 1. Good job on sewer information provided, a lot of work went into presentation. Commissioner Fairbanks – 1. No Report. Commissioner Garcia – 1. Thank you to Dustin, Rich and crews on work during last snow storm. 2. Larry Enfield would like to start meeting with the City Commission once a month. 3. The bricks from 10th to 11th and Main have heavy residue from the bricks, it looks dirty. Need to keep an eye on it when it rains. Commissioner Schields – 1. We need to continue to work toward getting a handle on parking to clean up city. Mayors Report – This was a good meeting, I know it was long but a lot of good discussion. Under authority of K.S.A. 75-4319 (b)(6) for a preliminary discussion relating to the acquisition of real property – Mayor Linin made a motion at 7:55 p.m. to recess into executive session under authority of S.A.75-4319 (b)(6) for preliminary discussion relating to the acquisition of real property not to exceed ten minutes. I request the Commission, Mary and City Manager be present. Commissioner Fairbanks seconded the motion. MOTION carried by a VOTE of 5-0. Meeting resumed at 8:05 p.m. Mayor Linin made a second motion at 8:05 p.m. to recess into executive session under authority of K.S.A. 75-4319 (b)(6) for preliminary discussions relating to the acquisition of real property for five minutes. I request the Commission, Mary and City Manager be present. Commissioner Fairbanks seconded the motion. MOTION carried by a VOTE of 5-0. Meeting resumed at 8:10 p.m. Mayor Linin made a third motion at 8:10 p.m. to recess into executive session under authority of K.S.A. 75-4319 (b)(6) for preliminary discussions relating to the acquisition of real property for ten minutes. I request the Commission, Mary and City Manager be present. Commissioner Fairbanks seconded the motion. MOTION carried by a VOTE of 5-0. Meeting resumed at 8:20 p.m.
ADJOURNMENT WAS HAD ON A MOTION by Commissioner Garcia seconded by Commissioner Fairbanks. Motion carried by unanimous VOTE, meeting adjourned at 8:20 p.m. Next meeting is scheduled for May 21, 2018.